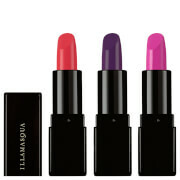 Be bold with your lip color with Illamasqua’s Matte Lip Liquid in Exoskeleton. A member of the Extinct collection, the liquid lipstick glides onto lips with unique precision and dries with an intense, highly pigmented, matte color. 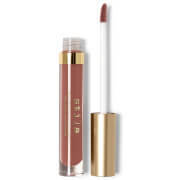 The formula is enriched with Vitamin E, which moisturizes the lips whilst delivering intense color. Exoskeleton is a plum shade of purple and creates a bold, dramatic finish to any look. Can be applied directly or with an Illamasqua brush. If directly, remove excess product from the applicator and apply a thin layer onto clean moisturized lips. Let it dry for 60 seconds before blotting your lips together, apply a second thin layer again leaving 60 seconds to dry. Dimethicone, Cyclopentasiloxane, Isododecane, Trimethylsiloxysilicate, Polyethylene, Talc, Cera Alba (Beeswax, Cire D&Rsquo;Abeille), Acrylates/Polytrimethylsiloxymethacrylate Copolymer, Dimethicone/Vinyl Dimethicone Crosspolymer, Disteardimonium Hectorite, Polybutene, Tocopheryl Acetate, Isostearyl Neopentanoate, Alcohol Denat. Sd Alcohol 40, Silica Dimethyl Silylate, Parfum (Fragrance) [+/- May Contain / Peut Contenir: Yellow 6 Lake (Ci 15985), Red 36 (Ci 12085), Red 7 Lake (Ci 15850), Red 22 Lake (Ci 45380), Yellow 5 Lake (Ci 19140), Carmine (Ci 75470)].